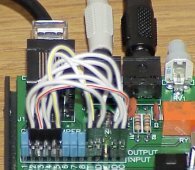 So you got a brand new LapTop computer and when you went to connect it to your RIGblaster you discovered there was no Serial Port. Since then you have been forced to run in VOX mode and then only if your radio has VOX. Well now we have a solution for this problem. 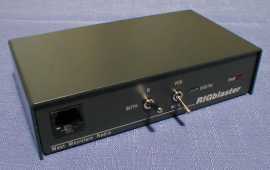 West Mountain Radio now offers a USB to Serial Port Adapter by IOGEAR, Model GUC232A, which will allow you to connect the RIGblaster to that new LapTop. It is available on our website for $34.95. Look under RIGblaster Accessories on the Pricing & Ordering page of our Web Site. Here is the simple way to use your 8 pin screw on RIGblaster with a Modular radio. As this picture shows, you simply plug your RJ45 mic into the back of the RIGblaster. Plug the cable that comes with the RIGblaster into the front of the RIGblaster and the other end of this cable goes to your radio's Modular mic. jack. The trick is you MUST crisscross the "MIC" and "PTT" wires on our jumper pins. 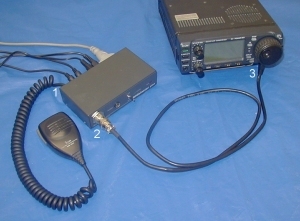 This example shows the Criss Cross jumpering for an ICOM IC-706MKIIG. See the PDF document on our Web Site called "CRISSCROSS" for all the jumper diagrams. As a result of the above, we are discontinuing production of the RIGblaster Model RJ. So while supply lasts, the RIGblaster RJ will be priced at $89.95 which is $20.00 of the regular price. Look under RIGblaster on the Pricing & Ordering page of our Web Site for more detail.